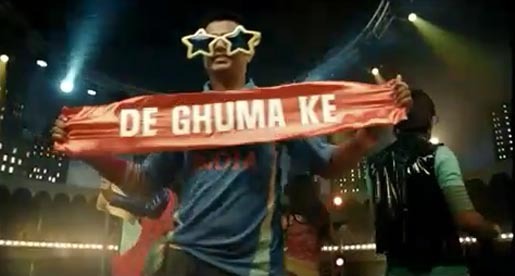 The ICC World Cup 2011 anthem, “De Ghuma Ke”, is being performed in Hindi, Bangla and Sinhalese throughout the Cricket World Cup in Bangladesh, India and Sri Lanka, from 19 February through to 2 April 2011. The song’s title, translated in English, “Hit It Hard”, artistically captures the full-on sense of competition and the aspiration to win. The music video for the anthem was filmed by Mumbai director Piyush Raghani, featuring trio Shankar Ehsaan Loy, cricket footage, and a choreographed troupe of dancers. The World Cup anthem is part of a campaign developed at Ogilvy, Mumbai, by creatives Sukesh Nayak, Heeral Akhaury and Hemal Jhaveri. Filming was shot by director Piyush Raghani via Old School Films, Mumbai, with producer Sudipta Banwar Karnik, line producer Annie Sukeshwala, director of photography Deepti Gupta, choreographer Longinus Fernandes, 1st art director Shradha Ojha, art directors Okeef, Glycen and Sheetal, costume stylists Swati and Schulen, make up artist Ravindra Samel, art director Minal Rath, offline editor Ernest D’Souza, online editor Karen Falcao, colourist Miten Udeshi. Music was composed by Shankar Ehsaan Loy (Shankar-Ehsaan-Loy, Ehsaan Noorani and Loy Mendonsa), with lyrics by Manoj Yadav sung by Shankar Mahadevan and Divya Kumar (Hindi), Raghab Chatterjee (Bengali) and Ranidu Lankage (Sinhalese).